We’ll be watching the kids have fun. There’s a generation out there who can remember a time when Crinnis beach was a place where people partied ‘til the sun came up. But after a decade of neglect Sam is proud to announce the opening of Sam’s @ The Bay – a brand new Tikki hut that will help to brighten up the tired shores of Carlyon Bay. 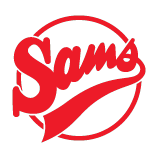 Plans are in place for a regeneration project to put the sparkle back into the area and Sam’s is the first to bring our own brand of Cornish cuisine to the beachcombers of Crinnis. Along with our celebrated style of food we’ll be adding our brand new Sam’s Lager to the menu – couple that with live music and theatre while your relax and take in some of the spectacular views that stretch to Polkerris and beyond.